A photo collage titled press++01.16, by German photographer Thomas Ruff, using newspaper photographs from the mid-20th century. From the collection press++., Chromogenic print, 72 7/8 x 91 inches (185 x 231 cm). Before there was Photoshop, there was the back of the photograph. The white space on the back of a photo is where newspaper editors would scribble notes about how to crop an image or where to place it in the article; it's where newswires would often paste or type a caption, thus assuring that the text could not be separated from the image it described. A series of works by German photographer Thomas Ruff brings those back-of-the-photograph scribblings to the front. 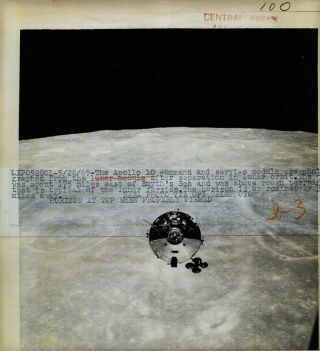 Using mostly spaceflight-related newspaper images from the middle of the 20th century, Ruff used digital tools to make it look as though the markings from the back had been placed on the front. In one piece, a space traveler's helmet is marked with an Associated Press stamp; in another, an editor's notes, written in red pencil, make an arc across the sky above a rocket that looks poised to launch. The aesthetic appeal of Ruff's photo collages is, of course, entirely subjective — I happen to think they're quite lovely. The black-and-white images that Ruff chose all seem to show moments of calm that come between moments of intense action in spaceflight: There's the quiet surface of the moon passing below a spacecraft; a rocket not yet ready to launch. They work well as photo collage backgrounds. I know it's more than just the aesthetic beauty that I'm personally responding to. I am a space reporter, and the writing and markings on these images were made by my occupational ancestors. I can imagine all too well the panicked atmosphere that might have surrounded them as they quickly scrawled on the back of photographs, making urgent decisions about how best to tell these stories. These editors worked hard to make themselves invisible, to let the stories stand on their own, but Ruff has brought them out into the spotlight. As I try to imagine these people at work, I think about the ways that their workday would have differed from mine. It occurs to me that there's a great irony about these photo collages: The editors were working with primitive tools — no Photoshop, no digital images, no email. And yet, the images recall the Apollo era and humans visiting the moon using technologies that, while technically archaic, are so out of reach to humans in 2016 that they seem futuristic. The editors who wrote those notes could not have imaged how much their profession would evolve, or how little the space program would. A photo collage by German Photographer Thomas Ruff, titled press++00.53, 2015. The photo collage is part of a collection on display at the David Zwirner Gallery in New York. Chromogenic print. 79 1/2 x 72 7/8 inches (202 x 185 cm). I spoke with Ruff about the works at the David Zwirner Gallery in New York, where they are on display through April 30. Ruff started collecting the space-age newspaper photographs without any intention of using them in his art, he said. He's an astronomy fan — he even thought about becoming an astronomer — and told me that "from time to time, astronomy shows up in my artistic world, and I'm always happy when that happens." He found the images on eBay, and thinks they're mainly from the Chicago Tribune and the Baltimore Sun. At some point it occurred to him to start playing around with the information conveyed by each side of these prints. By combining the two sides, its possible same information is lost, he said. For example, it's difficult to read the captions or get a good look at what the images show. But it's also possible to create something new — "extra fun," he says. I've certainly gained something new from looking at the images in this way. Even so, the science reporter in me wonders why someone would want to lose information. "Because I'm not a scientist," Ruff said. "I don't have to be precise with these images. I can play around. It's not my information that I want to give, it's somebody else's. So I can be very playful with these images and just [see] what happens if I bring the front to the back." These photo collages aren't like the scientific articles I write. There's no ideal, intentional outcome — no specific message Ruff wishes to convey. His goal when he started the project, he said, was more or less just to play around with photography, with the information that photographs convey. And that means the project didn't necessarily require that he use space photographs. It could very easily have been executed with non-space related images, and I would likely never have seen those images, and never connected with them the way I did. I feel a certain disappointment about that. Maybe because my own work, as well as science and engineering, has to be intentional to be effective, I feel strange about someone making effective work without a specific intention. As we continued to discuss the photo collages, Ruff starts to talk about the relationship that photography and astronomy have had through the ages. He talks about the first close-up images of the moon, broadcast back to Earth via radio, and later, when astronauts carried film cameras. Photography was intimately linked to arguably one of the greatest feats ever accomplished by humans. A photo collage by photographer Thomas Ruff uses a photograph sent to a newspaper, and the editor's markings on the back. In addition, astronomy is perhaps the most powerful example of the fact that the camera can show us things that our eyes cannot perceive. When I take a photograph I'm not just recording what I saw — I'm gaining new information. Observatories like the Hubble Space Telescope "see" distant galaxies and nebulas in ways that human eyes never could. Telescopes can be used to capture images that are aesthetically pleasing to a general audience — that are used to convey information about the size or beauty of the universe. Telescopes can also capture images that aren't particularly interesting to a general audience, but from which a scientist may extract new information about the cosmos. In photographing the universe, and everything it contains, the viewer is also responsible for how much information is lost, and how much is gained.